Mark Rozzi was born in Muhlenberg, PA to Lucio and Grazia Rozzi; immigrant parents who came to America in search of the American Dream. Marks parents worked endless hours in order to provide for their family. That hard work has been instilled deep down in Mark and has taught him that nothing worth doing is going to be easy. Marks father and his brother eventually saved enough money to start Rozzi Brothers Inc. in 1969 which later Mark would take over and run himself. 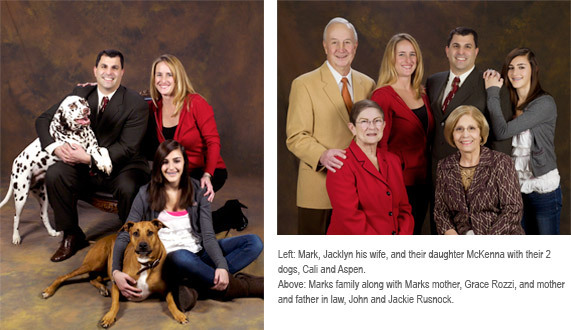 To date Mark continues to serve his loyal customer base at their location on Kutztown Road. Mark is a 1989 graduate of Muhlenberg High School where he was a member of the Political Science Club and Model UN amongst others. Mark was a 3 sport athlete being recognized as an All County recipient in both Baseball and Football. Mark, Jackie his wife, their daughter McKenna and their 2 dogs Cali and Aspen, currently reside in Muhlenberg Township where Mark has always been very active in the community, coaching Girls softball and Girls basketball. In fact, in 2008 Mark and his Wife coached the Muhlenberg Township Girls fast pitch softball team to Muhlenberg's first ever State Championship Title.